Hidden Lands is a band that came from the ashes of the Swedish band Violent Silence and is active since the year 2012. So far the band made two albums (“In Our Nature”, “Lycksalighetens”) on the Swedish Prog label Progress Records. The trademark of the band was that they had a no guitars policy. But this has changed on their new album “Halcyon” that Progress Records released last February. Keyboard player Hannes Ljunghall rediscovered the joy of playing guitar that was always his real first instrument. The keyboards are still present in the music of Hidden Lands but you can say that the band has broadened their musical palette. The album is opening with the track “The Prince Of Goofs”. After a mysterious synth intro the song develops into a nice up tempo Neo Prog piece with great drum parts of Gustav Nyberg. The keyboards are still prominently in the music of Hidden Lands. The next song “Water Spirit” is one of the two ten minutes long compositions. With Bruno Edling the band has a fine vocalist on board. He has a very specific voice which could be described as a voice with a slightly whining character. This fits very well with the often melancholic character of the music. “Water Spirit” is a diverse Prog song with some nice synth melodies and fine guitar work. “Ulleråker” has a more darker and progressive character with it's jazzy and classical piano parts. The first part has some RIO (Rock In Opposition) influences but this is followed by a beautiful synth melody in a style that reminds me of Kit Watkins. An intriguing song that seamlessly flows into the up tempo track “No One Is in This For Love”. The band is swinging now. In the second part of the song the Happy The Man (Kit Watkins) like synth melodies are back and are combined with some nice guitar work. The diverse music has a kind of Canterbury quality. Then it is time for the second ten minutes long composition entitled “The Silent Service”. The band is slowing down a bit and you can find some very nice vocal melodies in this song. Piano, organ, delicate synths, acoustic guitar and a jazzy electric guitar provides the needed diversity. I love the keyboard melodies. This wonderful song ends with a beautiful melodic synth solo. The next song is called “Songbirds” and is showing the greater musical palette of the band. Where the music of the first part is keyboard drenched, the second part of the song is more guitar oriented. “Octavius” is a short 3 minutes long instrumental with a pounding funky bass line. Sometimes the synth takes over the melody but this little piece is dominated by the bass of Phillip Basin. The album closes worthy with the song “Rooftop Farewell”. This nine minutes song of great diversity has lovely melodic vocal lines. It is one of the pieces in which all the great keyboard playing is placed next to nice guitar parts so that the music is more in balance. 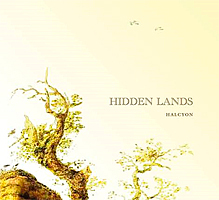 “Halcyon” the third album of the Swedish band Hidden Lands is an album full of beautiful keyboard melodies and vocal lines. With the added guitar the band has broadened their musical palette. The guitar is nowhere overwhelming or overruling the tasteful keyboards. For me it was a positive surprise to find this wonderful album in my mailbox. The music sounds new, fresh and transparent. A fine new work on the Swedish Progress Records label of Hansi Cross. Check this out!